HMH Books for Young Readers, 9780547053448, 80pp. Dr. Caitlin O'Connell is a Consulting Assistant Professor in the Department of Otolaryngology, Head & Neck Surgery at Stanford University School of Medicine and a world renowned expert on elephants and vibrotactile sensitivity. She is the author of the internationally acclaimed nonfiction science memoir, The Elephant's Secret Sense (2007, Free Press). Her narrative nonfiction photo book An Elephant's Life (2011, Lyons Press) uses a graphic novel approach to revealing subtle and intimate aspects of elephant society. 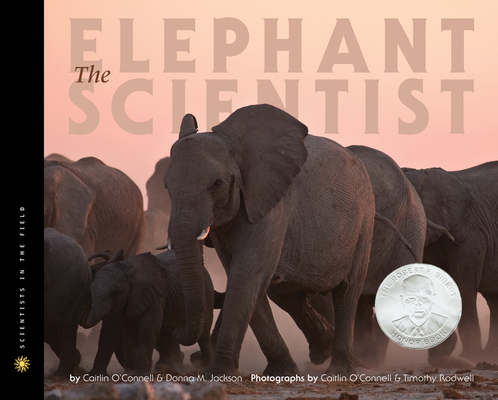 Her co-authored nonfiction children's book, The Elephant Scientist (2011, Houghton Mifflin Children's Books) won five awards, including the Robert F. Sibert Honor and Horn Book Honor for 2012. A Baby Elephant In The Wild (2014, Houghton Mifflin Harcourt Books for Young Readers) is a Junior Library Guild Select, and Elephant Don: The Politics Of A Pachyderm Posse (University of Chicago Press) came out in 2015. Her debut novel was Ivory Ghosts (Random House). O'Connell is the co-founder and CEO of the nonprofit organization, Utopia Scientific (www.utopiascientific.org), dedicated to research and science education. She is also co-director of Triple Helix Productions, with a mandate to develop more accurate science content for the media. She has written five screenplays with science themes and has just finished her first co-authored novel to inspire girls with an interest in physics. She has taught Science Writing for Stanford University and The New York Times Knowledge Network. Visit her author website at www.caitlineoconnell.com. Donna M. Jackson is an award-winning author of nonfiction books for children and holds a master’s degree in journalism from the University of Colorado at Boulder. Her works include the critically acclaimed Elephant Scientists, Bone Detectives, Bug Scientists, and Wildlife Detectives—all honored by the NSTA/CBC’s Outstanding Science Trade Book for Children award; ER Vets, an Orbis Pictus and ASPCA Henry Bergh honor book; and Extreme Scientists, named a Smithsonian Notable Book for Children, 2009. When she’s not writing about scientists in the field, Donna enjoys reading, skiing, gardening, hiking in the mountains, and spending time with her family. She lives in Colorado. Learn more about Donna at her website: http://www.donnamjackson.net. The photographers Caitlin O’Connell, Ph.D., and Timothy Rodwell, M.D., Ph.D., M.P.H., are scientists and professional photographers that have blended art and science to help make science more accessible and engaging. Their photography has appeared in National Geographic, National Wildlife Magazine, Discover, Science News, Africa Geographic, and many other international magazines, scientific journals, and newspapers. Caitlin is on the faculty in the Stanford School of Medicine and Timothy is an assistant professor at the University of California, San Diego School of Medicine.